I attended a home going, celebration of life, memorial service, funeral yesterday. It matters not what a final farewell is called - it's still saying goodbye to someone you love. A sea of 300 people, most dressed in white (per family wishes) packed a church built to hold a crowd, but still bulged at the seams. Along with the weeping there was singing, praising, hugging, praying, and remembering. I watched as the deceased's brother walked stoically in front of the gold draped casket. As the priest, it fell to him to dig deep to find the strength to say the words that would comfort the mourners. Her mother and twin sister needed the help of others to get to their seats. That's when I began to cry. I felt their pain. I felt my own. I've been in their shoes. I've had to make that long slow walk with wobbly knees. I've endured the heartache. I understand how the loss of a loved one is about as individual a pain as anyone can ever feel, and a communal emotion known to all of us since Adam and Eve buried Abel. It would seem that people of faith - any faith - would have it easy. We believe our loved one is "in a better place." We trust our loved one is the arms of the Divine. We pray that our loved one rests in peace. Yet no matter how much or how little faith one has, how many prayers are offered, how many casseroles shared, the mourner's journey is one each of us must make in our own time and own way. I don't think there is a word to describe moving through the gut-wrenching brokenness, to somehow living through endless days and nights, to somehow remembering how to breathe again, to somehow seeing calendar years pass by. Hard doesn't come close. The Japanese have a tradition/philosophy of repairing broken pottery with lacquer and powdered metals, such as gold or silver. In this way "Kintsugi art" transforms the broken piece into something beautiful. Resurrects it into a new, perhaps stronger, life. Perhaps this is what the mourner's path is all about - resurrection. Not just for the person who died. But for the ones left behind who must learn how to live without that person. 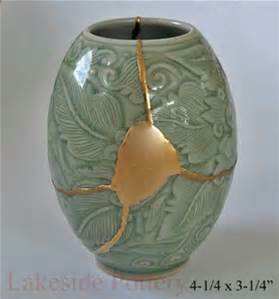 If ordinary pieces of Oriental china can be "re-purposed" by making cracks and scars visible, it follows (doesn't it?) that grief can do the same thing for the mourner. By traveling through grief's desert, those who mourn will, even if they don't think it can possible happen, one day bloom again. Is that why Jesus said "blessed are those who mourn"? Because He knew that their unbearable loss would one day be turned into undeniable strength? Today I met with a family who lost their son in 2014. We talked about making bears from their son's clothes. Eighteen months after his death, they still held on to the shirts, as if holding on to their son. The thought of cutting up his clothes brought them heartache. My job is to turn their pieces of cloth into tangible, huggable bears. I've felt the sadness, cried the tears. I've had to remind myself to breathe. I've carried the thousand pound weight of grief on my shoulders for days, weeks, years. I've come out the other side. Shaken yet steadfast. Rent yet resilient. Want to see the sun again, or hear the ocean. Remember your beloved in life, rather than death. Forgive your beloved* for leaving. Hear your beloved's favorite song in a grocery store and not run out leaving a basketful of cookies, chips and ice cream. Want to know something and ask Google instead of calling your beloved. Stop wearing your beloved's sweater and hang it in the back of the closet. Use your mother's china/sterling silver/sewing machine. Make your beloved's favorite meal again. Find yourself wanting to wear a brightly colored dress instead of black yoga pants and ratty T-shirts. See lovers holding hands, making goo goo eyes at each other and not want to throw up. Return to the places you and your beloved once frequented. Give up your stock in Kleenex, Tums and/or Visine. Take a walk instead of a Valium. Paint your walls a sunny shade of yellow. Let go of what might have been to embrace what is. Feel grateful to be alive.